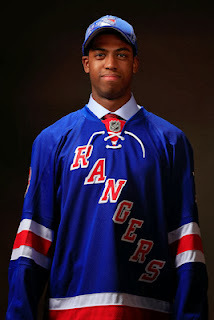 A pretty mellow Sunday for the New York Ranger and New York Islander prospects highlighted by who else but Anthony Duclair (NYR 2013 3rd) of the Quebec Remparts as all he did on Sunday was register his 14th game with 3 or more points this season. Duclair led his Remparts with a 2-1-3 effort as they defeated the Sherbrooke Phoenix 4-2. It was a typical day at the rink for Duclair as he opened the scoring with his 48th goal of the season in the first period. The goal at 12:36 was at even strength and really was all Quebec needed to win this game. Duclair would make it 2-0 in the 3rd period when he scored his 49th goal of the season at 2:39 also at even strength. Duclair would add his 43rd assist on an empty net goal which made the score 4-1. All in all Duclair with his 2-1-3 performance improved to 49-43-92 which is good for 2nd in the QMJHL. Duclair would be tied for the scoring lead in the QMJHL if not for the guy he is chasing had a 2-3-5 day of his own as he led Ryan Graves (NYR 2013 4th) and their Val-d'Or Foreurs to a 12-3 win over the Chicoutimi Saguenéens. Graves had an easy day registering a primary assist on the Foreur's 8th goal of the game. It was part of a 0-1-1, +1 on 1 shot and 1 hit effort from Graves who improved to 3-12-15 which is 1 point short of his career best for points. Loic Leduc (NYI 2012 4th) was scoreless but a +2 with a hit as his Rimouski Oceanic defeated the Charlottetown Islanders 5-3. Rimouski is chasing Quebec for 2nd place in the QMJHL's Telus East Division as they trail the Remparts by 2 points. Victor Crus Rydberg (NYI 2013 5th) scored his first goal in 21 games but it was not enough. Crus Rydberg's Plymouth Whalers let a 3-1 lead slip away and lost to the London Knights 5-4. It was Crus Rydberg's 7th goal of the season but the score was deceiving with London having the better of play throughout the game. Ryan Pulock (NYI 2013 1st) and his Brandon Wheat Kings visited the Swift Current Broncos with the lead in the WHL's East Division at stake but by the time the game ended, it was Swift Current who had taken over 1st place in the Division with a 3-0 win. Pulock was quiet for the most part just like his teammates as the Wheat Kings missed out on a chance to open a lead on the Broncos.